I just released version 0.21 of Wammu. This is again mostly bugfix release, which fixes various bugs reported by users. Tell user if he needs to be member of some group while searching. Avoid blocking opening of a browser. There is still no binary for Windows. I don't have time for debugging crashes that happen there. Update: I forgot to mention completely new Chinese translation! Published on June 20, 2007, 2:05 p.m.
As I wrote in past, one of targets in next stable Gammu release is to have much better support for Motorola phones. The biggest problem with them is that Motorola separated AT commands in two separate subsets and each can be issued in different phone mode. I just hacked support for this into Gammu, so basic operations with Motorola phones should work. If you have Motorola phone, I'll welcome you to test new code. Just download current snapshot or use subversion to get latest code, compile it and run against your phone. Published on June 17, 2007, 3:12 p.m.
Added suport for nick name in phonebook. Added suport for work address in phonebook. Converted to new Gammu API. Published on June 15, 2007, 9:33 p.m.
Added dku5fbus-nodtr and fbus-nodtr variants, which do not care about DTR/RTS signals (thanks to Jakub Zawadzki). Do not delete phonebook entries when there are none (bug #317). This release comes with new API, which should provide stable ABI for upcoming versions. If you're distributor, who had special dependency handling for libGammu, you can now keep it on soname, versions with same soname will be backwards compatible. For stable users, there are quite a lot of changes, especially for developers, conversion to new API will probably hurt. There is porting documentation included in sources and if it does not help you, feel free to ask! Stay tuned, release evening will continue ;-). 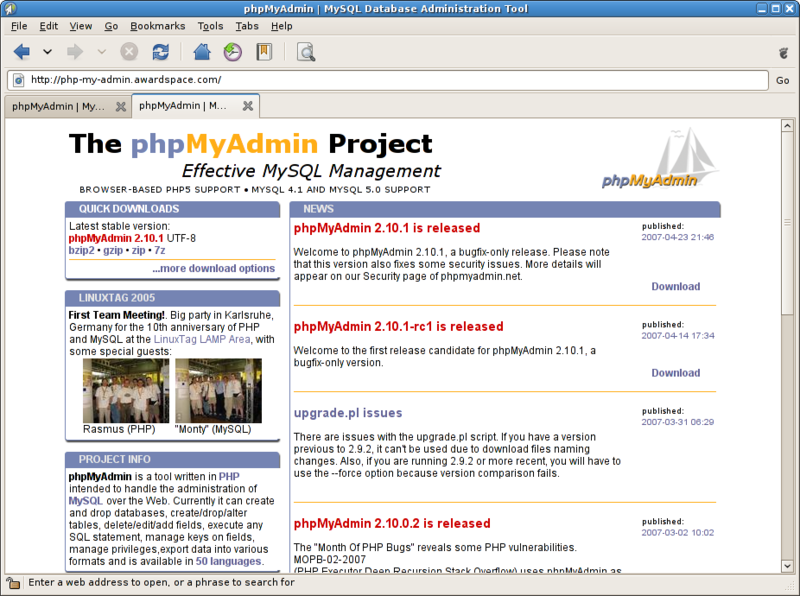 Published on June 15, 2007, 9:03 p.m.
phpMyAdmin is quite popular tool and it attracts people who want to earn money on it. 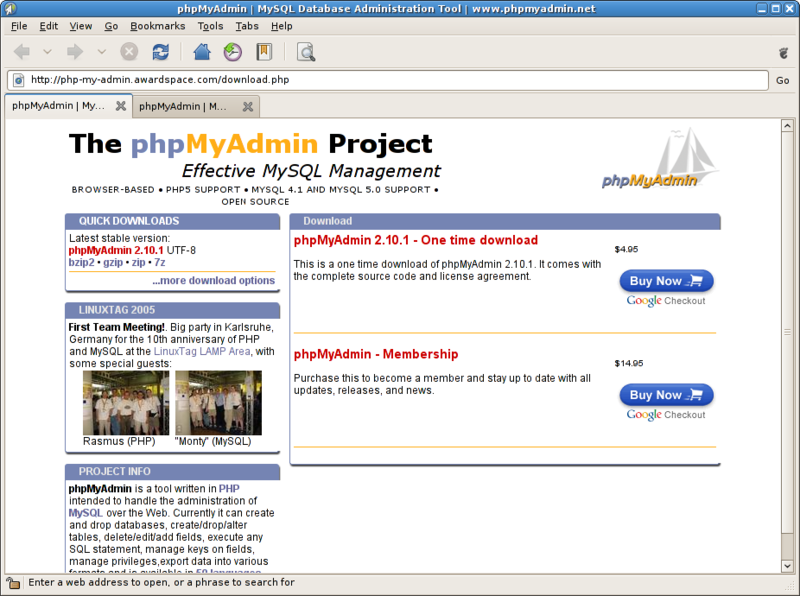 For long time Navicat company used phpMyAdmin name to propagate their completely different product, but this seems to be gone now (probably with help from Google, but I haven't receive reply from them, but short after my complain, all their ads abusing phpMyAdmin were gone). Lets see how long will it take to get them down. 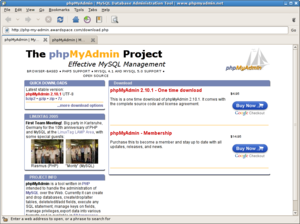 PS: There is intentionally no link in this post, you can see URL on screenshot, if you really want. Thank-you for your e-mail enquiry. 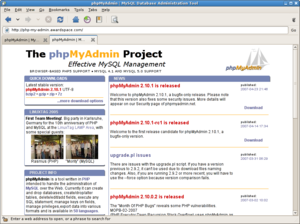 Please be advised that we have disabled site php-my-admin.awardspace.com. AWARDSPACE.COM provides legitimate web hosting services and has a ZERO tolerance policy towards these violations. We apologize for the inconvenience this has caused you. If you still have any concerns in regards this matter feel free to contact us. Published on June 12, 2007, 2:54 p.m. Some time ago I added links to FoneWiki.org to Gammu phone database to show more information about phones. The main reason for that was information about K750i phone, which I wanted to buy in that time. Unfortunately as time goes on, this page seems to be almost the only one with interesting content on this wiki. Most of other pages are only templates or links to buy cheap v1agra or some other similar spam. It's a pity that this server is gone, because I think such wiki is a good idea. Published on June 11, 2007, 6:06 p.m. Properly report uploaded file size when using OBEX. Support for iso charsets in AT phone when iconv is available. Fix restoring of phonebook over OBEX (bug #317). There is no error on most fields when storing to vCard. Fix detecting length of input (thanks to Peter Stuge). Published on June 7, 2007, 4:11 p.m.
As Wammu won't have filesystem support in near future (and I'm not sure it will ever have it), I decided to package gMobileMedia for Debian. For now the package is sitting in NEW queue, but impatient can get it from my repository. Published on June 5, 2007, 3:36 p.m.
As new API is currently in pretty good shape, stabilisation period for 1.12.0 will begin soon. There should not be any major changes (well some might be in 1.11.92 this week, but no further). 1.12.0 should be unleashed within two or three weeks. So maybe it's now time to start thinking about changes in 1.13.0. As requests for supporting Motorola phones increase, I will try to work on this. Most of information which changes this require is written in bug report, but I'm still unsure how big changes it will require. Other thing which should be improved is vCard parsing. There are lots of opened bugs for this and I see this as big problem when trying to import some contacts from other programs. Published on June 4, 2007, 1:53 p.m. Fixed compilation on OS X. Added --features to show compiled in features. Add support for work address. Added source examples in docs/develop/examples. Published on June 1, 2007, 2:18 p.m.